Jul 17, 2017Harry Prevor . Last weekend, we saw the last ever World Youth (aka, under-18) Championships take place in Nairobi, Kenya. The event may have been canceled by the IAAF going forward and boycotted by the U.S., Canada, and Britain, but nonetheless they certainly saved their best for last, as the stadium was packed peaking at 50,300 spectators for yesterday's evening session -- the most of any World Youth event in IAAF history (and more than double the Hayward Field all-time attendance record). Here were the five best moments. You could tell that 17-year-old De'Jour Russell of Jamaica was a force to be reckoned with straight out of the heats, as he already broke the Championship Record and won by almost a full half-second Thursday afternoon, splitting a 13.08. But what nobody could have predicted was that Russell was saving his best for last, and during the final he completely demolished the field to beak his own Championship Record again with a 13.04 clocking. Russell's time is not only the world youth and world junior lead -- it is the third-fastest time, period, among competitors of any age in the world this year. Look out for Russell as he matures over the coming years. The mixed-gender 4x400m Relay may be a new event, but with the news of its inclusion in the 2020 Olympics, the youth athletes got some very valuable experience at World U18s this weekend, and the ability for teams choose the order of their runners (always two male, two female) made for some very interesting races. One of these was the first heat, in which Kenya was the only team to select a girl to be their anchor leg. Though ridiculed by many, their decision ended up paying off and more, as despite being even with the boys with 150m to go, Mary Moraa unleashed a devastating kick that even Jamaica's Tyrese Reid and Brazil's Alison Brendom Dos Santos could not match. Team Kenya's time of 3:24.76 was the fastest of all 13 teams in the heats. Having no international performances on record before the champs, Argentinia's Elian Larregina knew he would be the underdog going in to the boys' 400m heats. But that didn't stop him from going for the win early, taking the early lead and maintaining that through 200m. Just before 300m, it looked like Larregina had the race won and his qualification for the next round secured, before the all-too-familiar last 100m began to take its toll. Larregina took a dive for the line with five meters to go, and he ended up just short, having to eventually get up and walk across in 59 seconds. Watch Larregina's run (timestamped to start at the correct time) HERE. Kenya's Mercy Chepkurui and Caren Chebet looked about even with 200m to go in the rarely-run 2000m Steeplechase final, ready to go 1-2 for their home crowd in Kenya. Though Chepkurui looked to have a slight advantage at first, the final water jumped changed all of that as she tripped and fell to her knees coming off the barrier, allowing compatriot Chebet an opportunity to seize the lead. But what made this race so exciting was that Chepkurui kept fighting after getting up from her fall, and eventually took a strong lead over Chebet with less than 100m to go. Ultimately that lead proved to be not enough though, as Chebet unleashed a final sprint that Chepkurui could not match to become the World U18 champion. At just 17 years old and five feet, seven inches tall, South Africa's Breyton Poole is far from what most would consider champion high-jumper material. 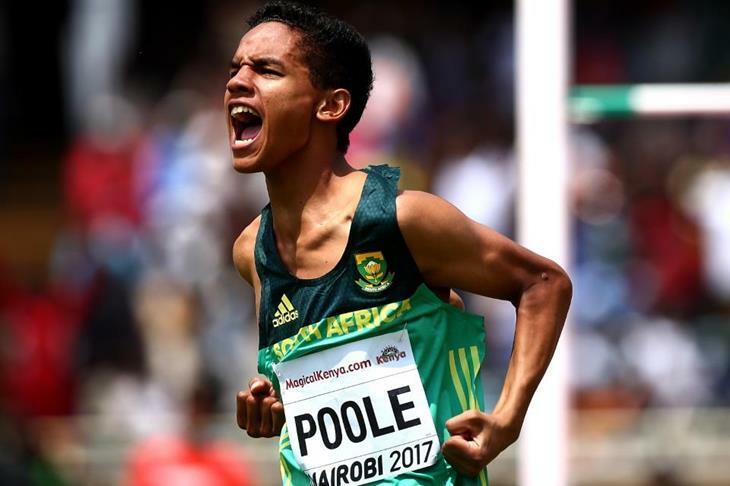 But at World Youths, Poole proved his skeptics wrong as he took the overall title in 2.24 meters (seven feet, four inches), beating out second-place by a full tenth of a meter. Poole has been jumping since the ripe age of 10 years old, and he's only continued to improve every year since then. To quote Poole himself after the big win, "They thought I wouldn't be able to adapt to it because I was so short. I proved them wrong."